Francesco Possenti was a popular young man in the social circles and dance halls of Spoleto, Italy. He was a handsome man who took special care for his appearance and was careful always to make a good first impression--especially upon ladies. He was known by his peers as a kind and articulate man. To the parents of his female peers, he was a prime target for a "successful marriage." Yet, his life had been difficult as his father moved around with his job. Eventually some of Francesco's siblings died from various diseases and his own mother died while Francesco was a child. Though it seemed that many of the girls he danced with were very eager to have him as a husband, he continued to turn them away. You see, at thirteen, he had fallen ill and made a vow to God that he would enter the ministry if God would restore his health. Francesco recovered but soon he has forgotten his vow and had resumed his life of careful devotion and pleasant social engagements. Two years later he developed a throat abscess and once again promised God a life of service if God would heal him. He recovered but once again cooled in his fervor as life returned to normal. 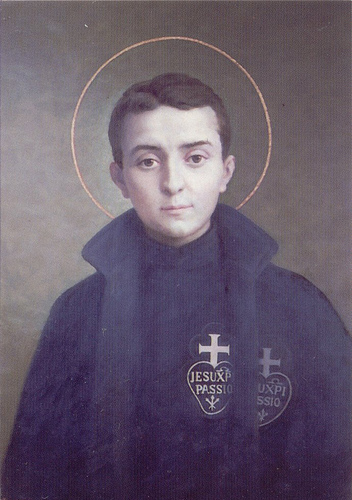 Apparently, he made this vow again when his head was grazed by a stray bullet but failed to follow through.Once, however, he went so far as to begin the process of joining the Jesuits and break off a pending engagement but for some long lost rationale he stalled the process and returned to his old life. Francesco's sister--Mary Louisa--died from cholera some time later and Francesco was shaken to the core by her death. After theirmother's death it had been Mary Louisa who had become a second mother to him. He had been shaken by his older brothers' deaths (one from suicide) but the death of Mary Louisa was distressing in a way he could not clearly or cleanly articulate. The clergy of Spoleto processed an icon of Mary, the Mother of Jesus, through the streets as an act of healing and prayer for the community then beset by cholera. As the icon passed by, he was enthralled and heard a voice questioning him, saying, "Why are you still part of the world that you've been called out of?" He didn't have an answer. So, he finally became serious about a life devoted to ministry and decided to join the Passionist order. At first, his father laughed him off since he had declared his devotion before only to back out after some time. Yet, he persisted and his father finally sent him to the monastery with his blessing. As Francesco traveled, he visited relatives along the way to see how they were doing. Yet, his father had primed them with questioning speeches and thoughts in hope that if this was yet another insincere commitment that he would return before he ever arrived at the monastery. They were unsuccessful in persuading him to give up on the life he had finally truly committed to.While a novice at the monastery, he was an excellent student and obedient to a fault to his superiors. He took his vows and the name Gabriel of Our Lady of Sorrows. Yet, he contracted tuberculosis before he was ordained a priest. He thanked God when he was diagnosed because he had prayed for some time that he might die slowly and make his dying a spiritually formative experience in his life. He spent his remaining days praying and practicing the Faith that held him. Shortly before his death, he ordered all of his writings but his letters to be burned so that he might not be arrogant or puffed up with regard for his own writing or intellect. The man who had so long avoided the vows he had made had finally found comfort in a life of devotion and service. He died peacefully and was buried shortly thereafter.